Study comics at the University of Dundee! 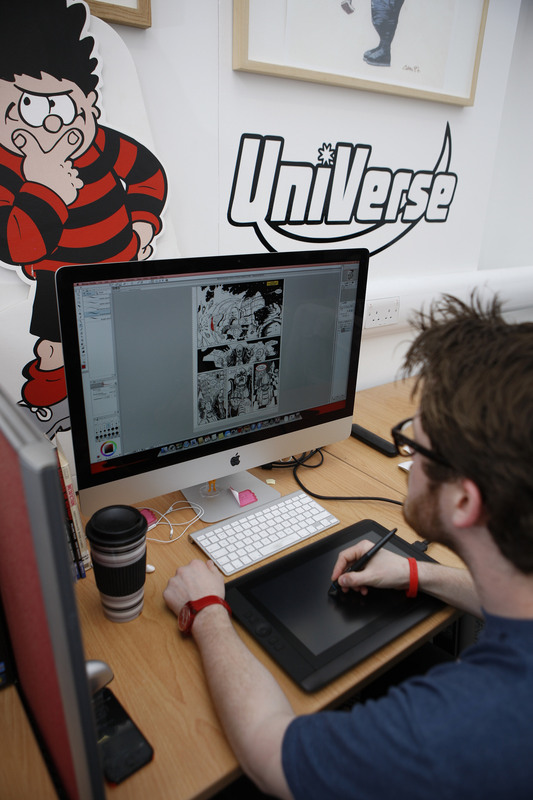 The University of Dundee offers a range of courses in comics at both undergraduate and postgraduate level. There are opportunities for a range of practice based (creative) assessments alongside more traditionally academic ones. The courses are supported by workshops and events that give access to industry professionals, foregrounding principles of employability and engagement. The aim of the MLitt in Comics Studies at the University of Dundee is to allow students to examine the fascinating medium of comics in terms of genre, style, formal properties and history. 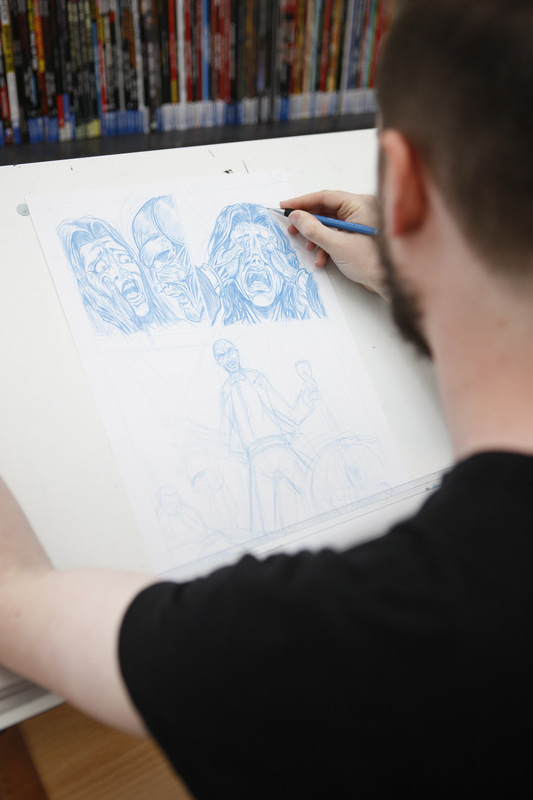 The course combines the academic study of comics with an opportunity to produce creative work, and to engage withy industry professionals. 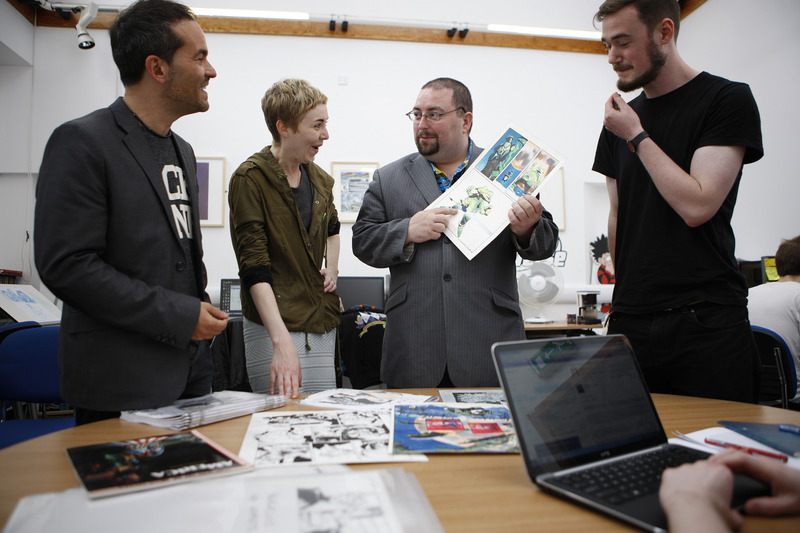 There are several PhD students currently undertaking research on comics at the University of Dundee. Many of them are in receipt of highly competitive AHRC funding. 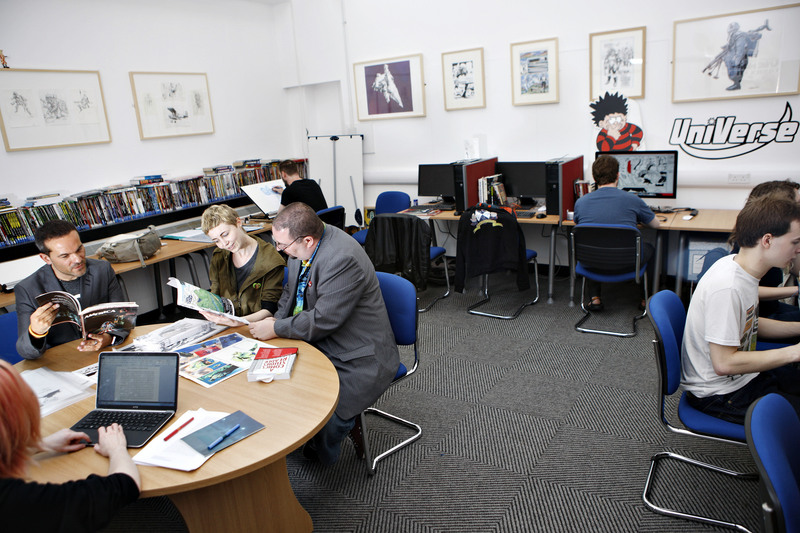 There is a dedicated workshop and teaching space in the Baxter Suite, Tower Building for the use of all Comics Studies students. It is a space where they can work on comics projects, and where some of the comics teaching is based. 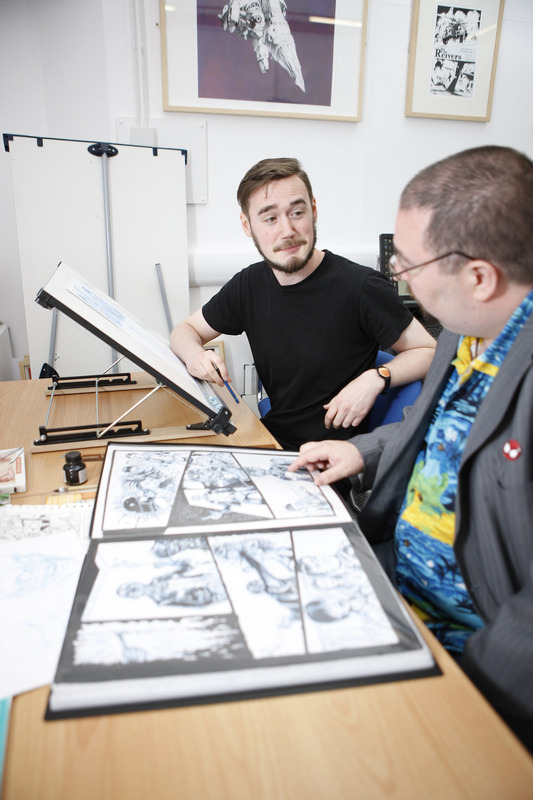 It is named for one of the most influential and beloved Scottish comics artists, Cam Kennedy, who regularly runs workshops for comics students and has supported Comics Studies at Dundee for several years. The room contains a sizable collection of graphic novels and comics generously donated by comics writer Grant Morrison. There are also a growing collection of books that have been purchased by the School or donated to the room. The studio has an exhibition of original artwork, which extends into the adjacent Baxter Lecture Theatre. I’m interested in an PhD in Comic studies. Is there a current online program? I live in Virginia, United States. Hi Willie, thanks for getting in touch. As someone who has studied from their bachelors, to masters to a current PhD in comics at Dundee I can definitely recommend our courses. Unfortunately we have no online program at this current time but if you check out the University of Dundee Comic Studies site you can find out more about our available courses. Thanks for getting in touch, if you need any more info or links to sites etc just let me know. i am from strathclyde university and am working on a project to create a short graphic novel story for fresher’s. 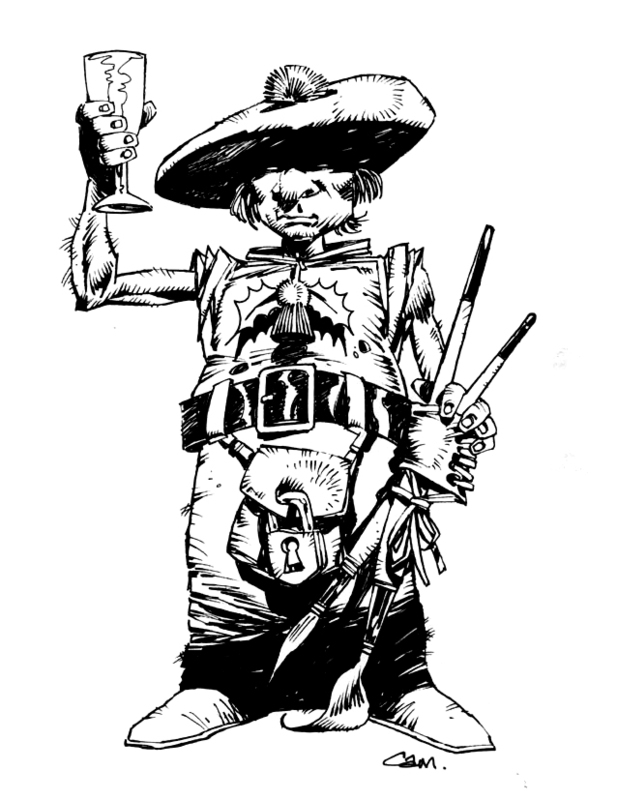 we have a basic storyline but need a graphic artist to ink the work. it is a very simple story and we wish it to be soft, simple and dream like in quality. we are also volunteers so cant pay but if this works out we will access funding to make it into a larger pilot.